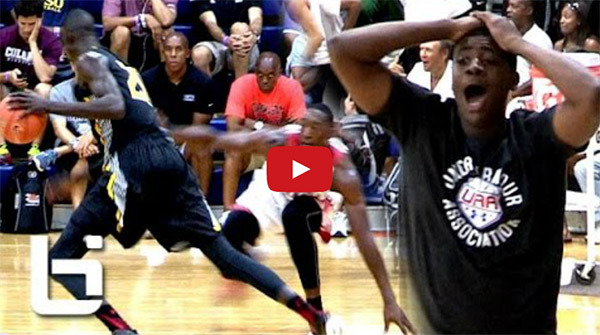 WATCH: 7'1 player makes crossover, what happens next is impressive! Home / basketball / news / sports / video / WATCH: 7'1 player makes crossover, what happens next is impressive! Here's a 5-star prospect basketball fans worldwide would surely love to see in the NBA in the future: a 7'1 player who can move like a guard! Check out this video featuring Thon Maker, an 18-year-old Sudanese-Australian, who broke the ankles of his defender, Edrice Adebayo, then hits a jumper from the arc at the Fab 48 tournament in Las Vegas. Many couldn't believe that a player who has a height of an NBA center can do crossovers, hit threes, block shots, dunk, and rebound all in one outing which, in the eyes of an ordinary person, is quiet impressive. Maker still has a year to stay in college—sports sites guess he would choose either Florida State, Arizona State, Indiana, Kentucky or Oklahoma State—yet the expectation for this promising player is already high.